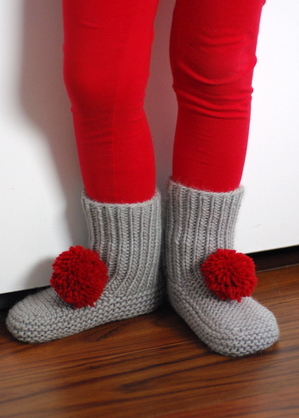 Modifications: Knit these child size by using size 6 needles and a single strand of yarn. Cast on one less stitch to knit the ribbed cuff in the round on DPNs. I decided to start off the new year with quick and easy pair of slippers for Camdyn. We had a spell of cold weather here in Las Vegas (including a couple inches of snow! 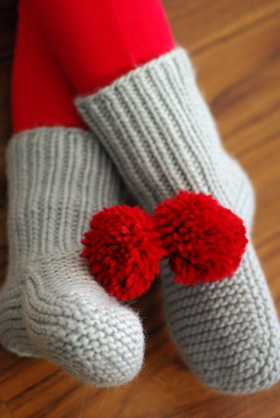 ), so the timing couldn't be any better for a cozy pair of slipper socks to keep her feet nice and toasty. The pattern is written for one size only (Men's Medium) so I had to make a couple changes to size it down. I basically decided to just use a single strand of yarn and smaller needles and hope everything turned out kiddie sized. Luckily things turned out pretty well. The pattern knits up super quickly, and even more so because I opted to knit the ribbed cuff in the round (I cast on one less stitch to begin with). This cuts out a lot of the end seaming. I can almost guarantee that I'll be using this pattern again, further experimenting with needle size and gauge to make a variety of sizes. The yarn I used, Valley Yarns Berkshire Bulky, is a hefty single. I knit it at a fairly tight gauge and so far I haven't had a problem with pilling--even though they've been worn quite a bit around the house, including a some floor skating sessions. The garter stitch sole makes them extra cushy. I'm really wishing I had a pair for myself! Now that 2011 is here I'm hoping I can stick to my resolutions and make this a much more productive year than last. Knitting seemed to fall by the wayside as life got in the way over the past few months. My goals for this year are to try out some new yarns, destash lots of yarn, knit from my stash as much as possible, and get rid of all my old UFOs! Since I failed at my 10 Shawls in 2010 goal, I might reattempt that this year as well as 11 pairs of mittens in 2011.